Your home is one of the biggest investments you'll ever make. It's where you raise your family, relax with friends, and spend a great deal of your life. It should be exactly what you want, so building from scratch just makes sense. There are many quality home builders in Ludington, Manistee, Pentwater, and West Michigan who specialize in building you the perfect home--energy efficient, attractive, well-built, and something you will love for years to come. Find a builder in the Home Builder Directory who truly enjoys working with clients--listening to their needs and dreams--and making them come true--from paper to the construction site. Trust is extremely important in this type of venture, and you'll want to feel comfortable in your relationship with your builder as your new home is constructed. You'll also want a builder with a good track record of building many homes, and don't hesitate to ask for referrals. Knowing that you are working with an experienced, reputable builder will give you the peace of mind to know the job is being done right--by the books--and to code. Your home building project is a major construction job, perhaps more easily understood by breaking it into four phases. Phase I includes the excavation, pouring the concrete floor for the basement, preparing the foundation, and back fill against the home. They will also grade the site for proper drainage. This process usually takes around 30 days. Phase II is one of the most exciting phases, as the framers come in to build the walls. You can start to see your new home taking shape during this phase. Roofing is also done, as well as doors and windows installed. After this, your home will be completely weather-proofed and ready for inside work. Phase III involves the rough-in for the electrical, plumbing, and heating systems. Since everything must be inspected, there may be a slight pause in work, but once the inspections are complete, your builder can insulate and drywall the home. At the same time, the siding crew will be finishing up the exterior of the home. Phase IV is the final phase, where the finishing touches are applied, like paint, doors, trim, cabinets, countertops, fixtures, and flooring. If your builder takes pride in these details, they will not rush through the job. Now you're ready to move in, with a typical construction period of 120 days from start to finish. Invest more in the "nice" things for your home by spending less on your heating bill. Ask your builder to install a 95% high efficiency forced air gas furnace that will keep you warm but save you money over time. They also insulate your basement walls to keep it warm and dry, use R-21 insulation in their 2x6 walls, and spray foam insulation in the rim joists. A programmable thermostat and Low-E, Energy Star Anderson windows complete the energy-saving package for your home. One of the advantages to building is that everything is new...the appliances, the furnace, and the bathroom. That means you won't be spending money "fixing" things. Plus you can enjoy your home knowing you're the very first ones to live there. Your builder can help you select from many different floor plans, or they will help you customize a plan based on what you would like. They also offer barrier-free designs with no step-ups and wider door frames. 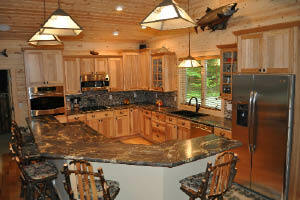 Simply put, when you find the right builder from the Home Builder Directory, it makes building a new home easy for you. 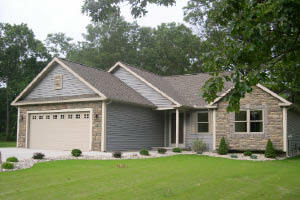 They take care of the permits, inspections, and everything else associated with the new home building process. 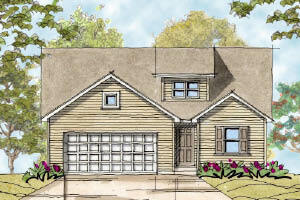 Once you choose the design and sign the contracts, you can sit back and enjoy watching your new home come to life. They urge you to call with any questions, with no obligation. Consider getting a home with all the things you really want--trust a West Michigan builder with helping your dream home come true. Thanks to Joe Hayes at Maplewood Homes for his input on this article. 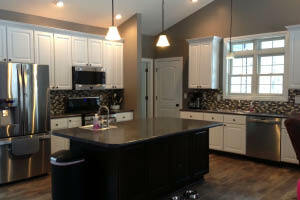 Photos courtesy Maplewood Homes.